Maybe it’s a guy thing. But I, for one, would like to see the Navy’s new Expeditionary Rock Crusher in action. Look at this bad boy! 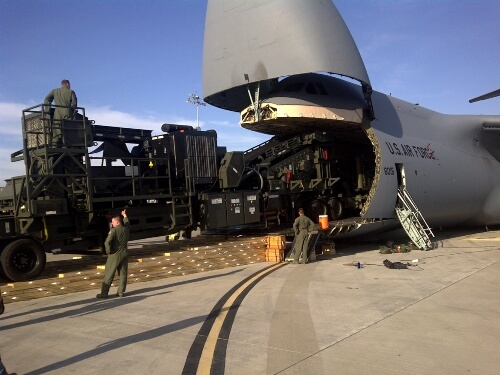 The crusher/rock impactor and plant together weigh approximately 119,300 lbs., which is child’s play for a C-5 Galaxy. It fits, as you can see. And now, it’s certified to be loaded and shipped anywhere Seabees operate. Seabees can build anything, but one thing they build a lot of is roads and airstrips for the Navy and Marines. That’s where the ERC comes in. Previously, the Seabees couldn’t easily deploy a rock crusher, and had to rely on local raw materials and suppliers to produce much of the stuff for their construction projects. Now, they can deploy the ERC and create their own mineral base products for concrete and asphalt that meet their high standards. The machine is essentially a militarized, field-painted version of the commercial Eagle 1200-25CC with the UM25 impactor. The Naval Construction Force — the Seabees’ parent command — owns four of them so far, according to the Naval Facilities Expeditionary Logistics Center. They haven’t yet been fielded, but Seabees will begin using them this summer, NFELC says. WOW, amazing to see the evolving of Seabee equipment to meet the demands of future operations. The ERC will an extraordinary boost to our TOA and capabilities to accomplish our mission. I love it! Also, there is no doubt our Seabee’s can’t wait to operate it!